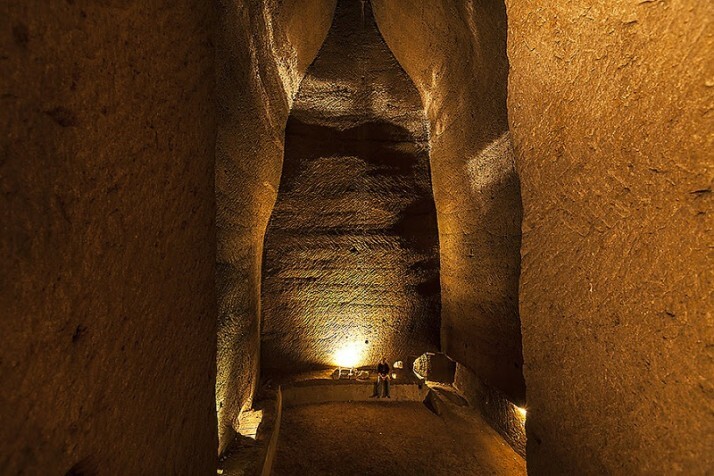 The rock which Naples is built on must be something like a lace doily as there are at least two different companies running tours to ‘underground Naples’. We opted for the ‘standard’ tour of the Bourbon Tunnel. First we descended 30m below ground into 17th century water cisterns carved directly into the tuff stone. Mariarosaria showed us the footholds in the rock which the pozzari (mainenance man) for the cisterns would have used to climb in and out through the well shaft – a truly scary thought, even worse he would have been in pitch darkness and obliged to find his way by touch as obviously there was no electricity in those days. During WWII the cisterns were partially filled with soil and converted into an air raid shelter. We saw leftover pots and pans, a gas mask and toys as well as graffiti scratched into the walls which the volunteers found while working to clear the area from debris in the early 2000s. The shelters are so deep that those sheltering wouldn’t have been able to hear the bombs exploding and someone had to go up to the surface to check when the all clear could be sounded. 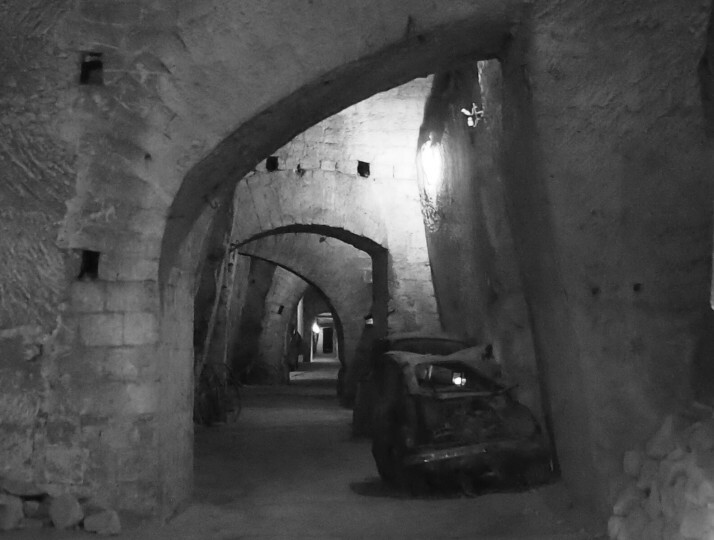 At one side the bomb shelter connects with the 530m long Bourbon tunnel, running in a straight line between the Royal Palace and military barracks in Via della Pace. It was built by King Ferdinand II in 1853 after the revolution. It was supposedly a gift to the city as the plan was that it would be lined with shops, but in reality it was intended as an escape route for him and his family in the event of another rebellion. 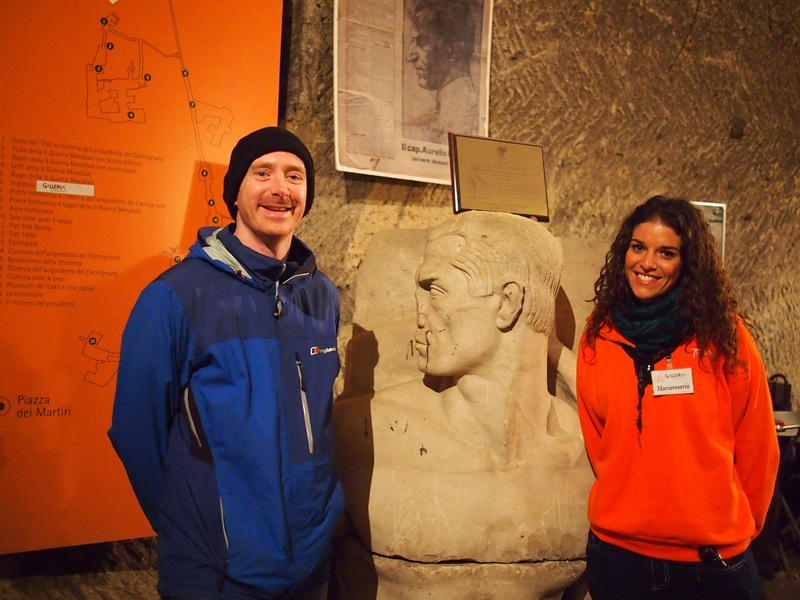 His architect never achieved the full plan of 12m high and 12m wide as he kept hitting water cisterns which needed to be bridged and then he came across pyroclastic material (gravelly sand) which was difficult to tunnel through; work was abandoned when the king died in 1859. 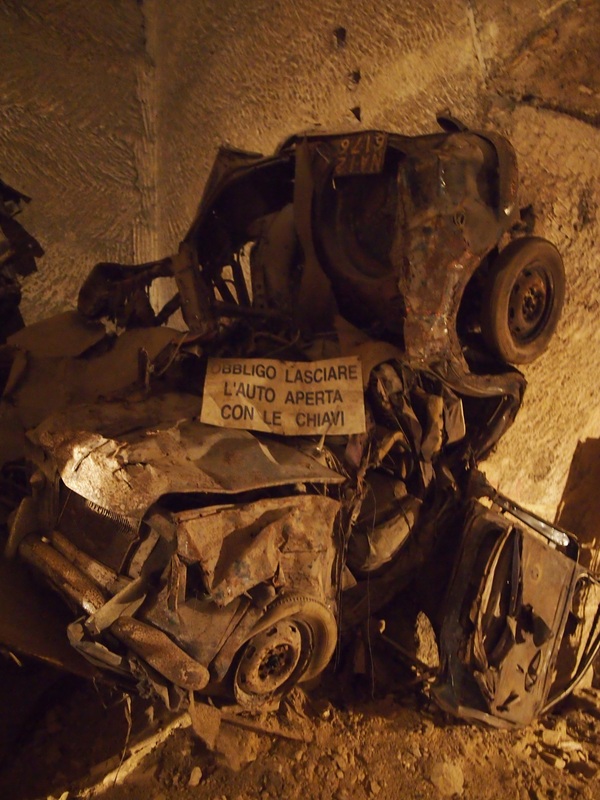 From the 1950s-70s the police used the tunnel as storage for impounded vehicles and the remains of rusty old cars and motorbikes line the final stretch of the tunnel leading to Via Morelli. These were fascinating to see and hear stories about, many were impounded for illegal modifications, or because they were used for smuggling. 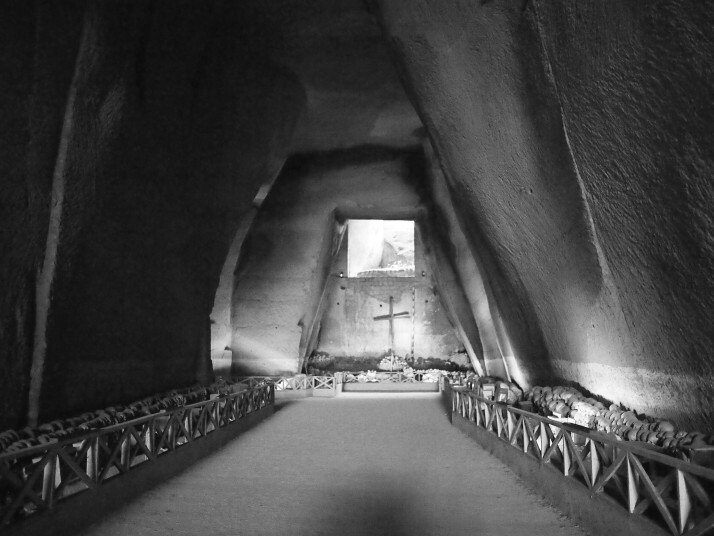 The Fontanelle Cemetery is situated inside a large cave in the side of the Capodimonte Hill to the north of the city centre. It has been in use as a burial site since the 1500s but received its first major influx in 1654 when plague struck Naples and there was nowhere to bury bodies. The poor continued to be buried here through various epidemics and famines until the cholera epidemic of 1836. 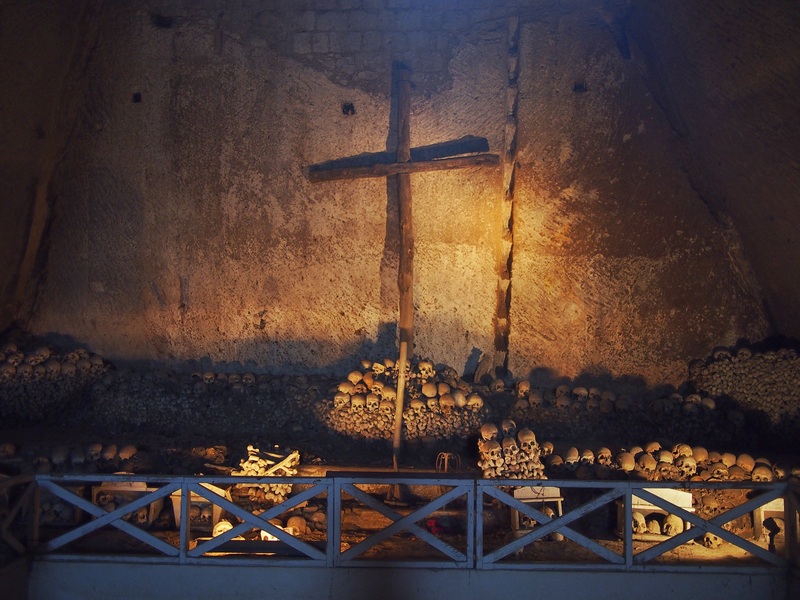 In 1872 a priest, Don Gaetano Barbati, catalogued and sorted the bones into the neat arrangements along the cave sides which are still found there today. We were surprised by how high and wide the cave is. Perhaps because of this the lighting seems to cause as much shadow as illumination and there were lots of spooky corners. A cult of leaving offerings for the skulls and praying for the souls in return for favours sprang up in the mid 19th century. 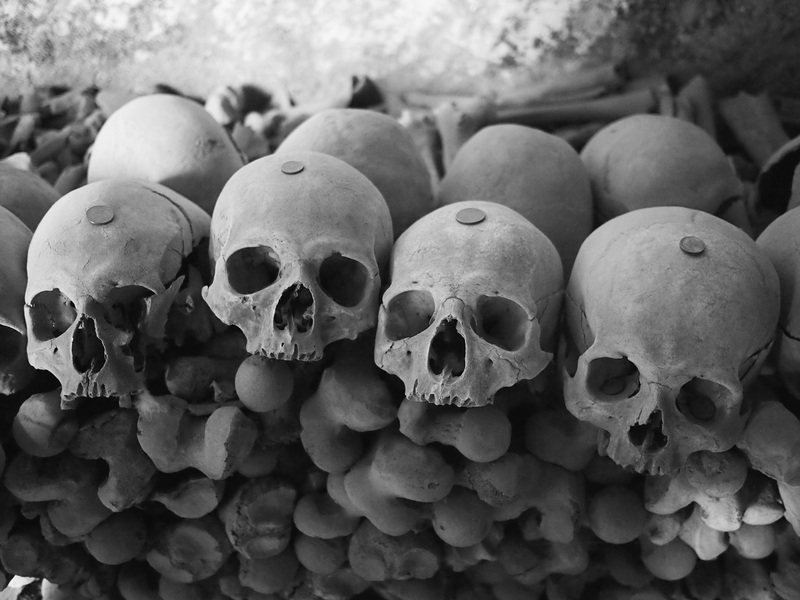 It continued until 1969 when Cardinal Ursi decided it had gone too far and closed the cemetery. It was reopened as a historical monument in 2006 but obviously old habits die hard as we saw various offerings around the cemetery. 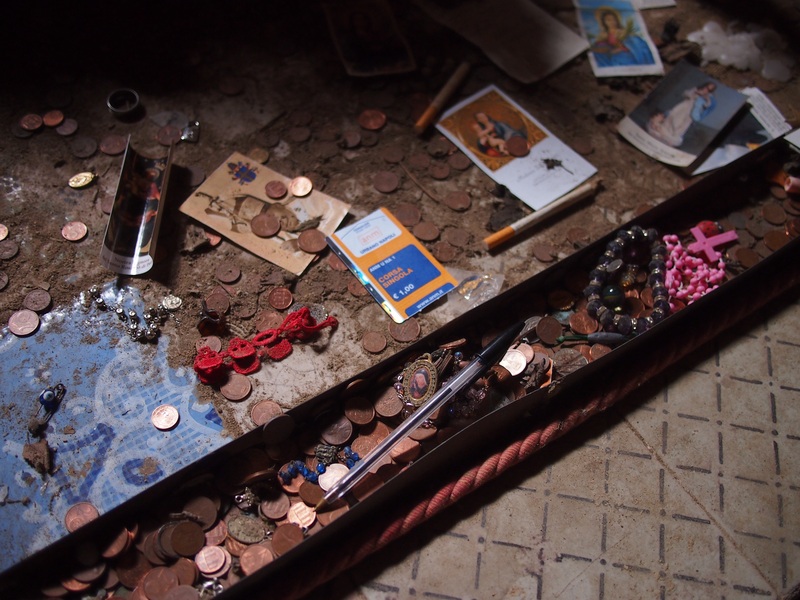 Most of the offerings are small coins but we also saw rosary beads, pens and even cigarettes and a metro ticket! 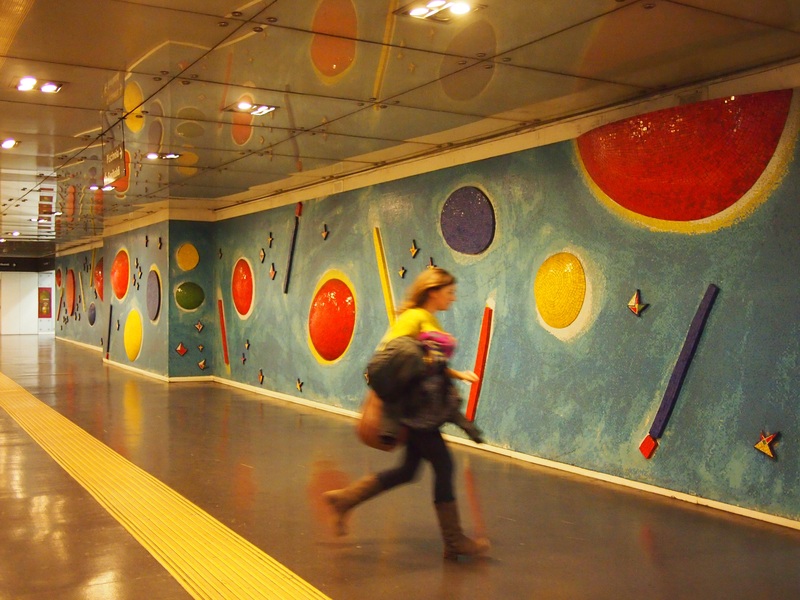 We’ve seen beautifully decorated Metro stations before in Russia and Tashkent (unfortunately no photos allowed there). 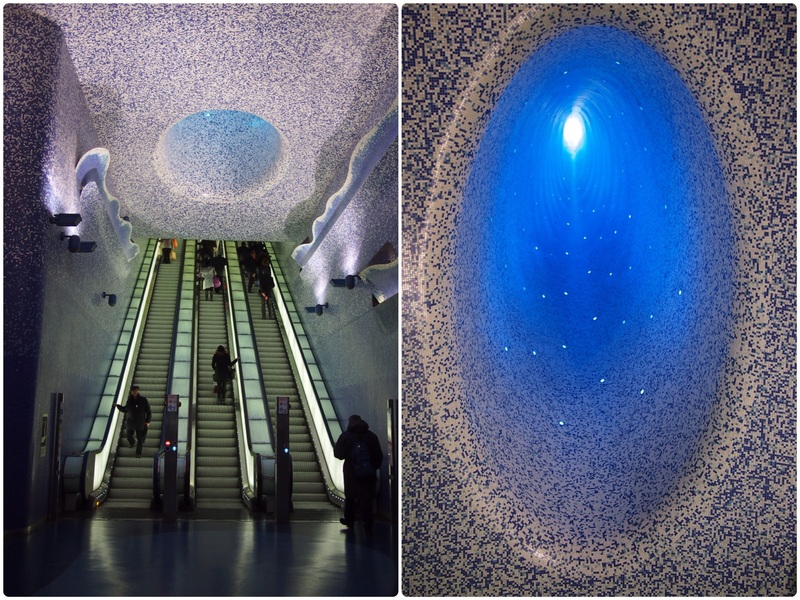 In Naples the subway system is still under construction and the city has engaged well known architects to design some of the stations and contemporary artists to decorate them. 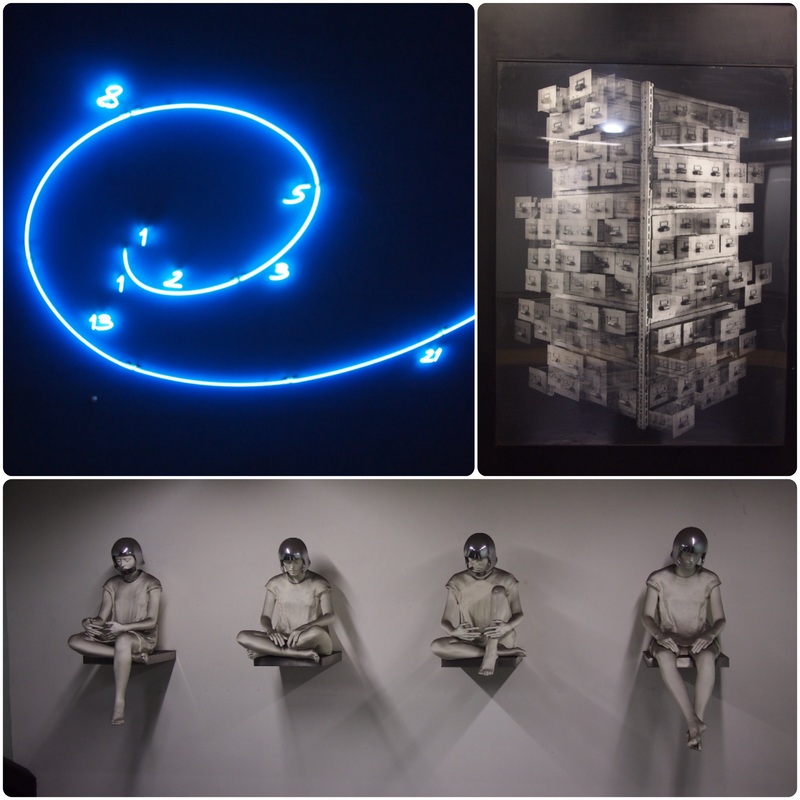 The aim is to create a regenerating effect in the impoverished city. I think public art is a good thing in general and I like it being integrated into the residents’ daily commute – much as we drove past the Angel of the North every day on our way to and from work at home. 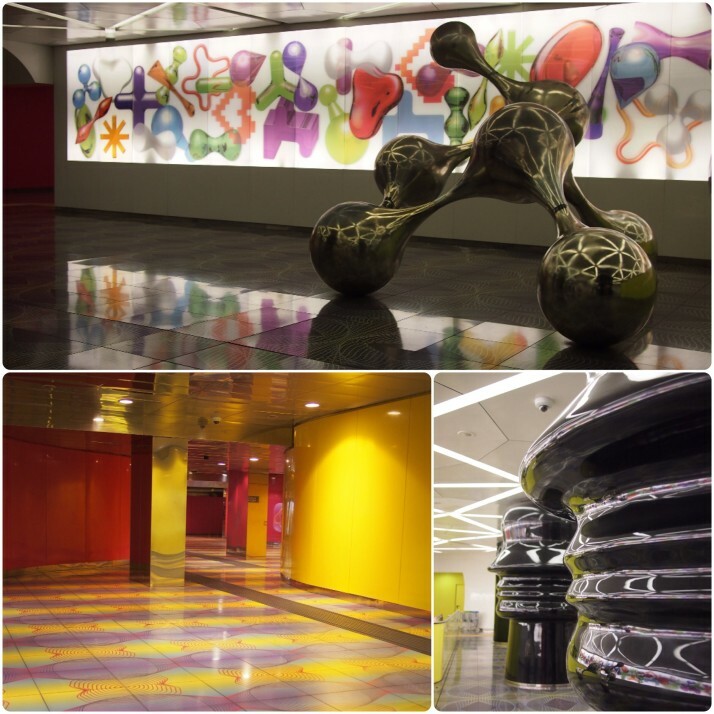 Although there are a few art stations on line 6 in the east of the city we confined ourselves to line 1 which has ten art stations. Armed with an all-day ticket and PDFs with information about the artworks to be found in each station we set off to explore. Some stations seem to just display a variety of artworks, while others are more of an artwork in themselves having a unified feel and decorated floors and walls as well as sculptures or pictures. 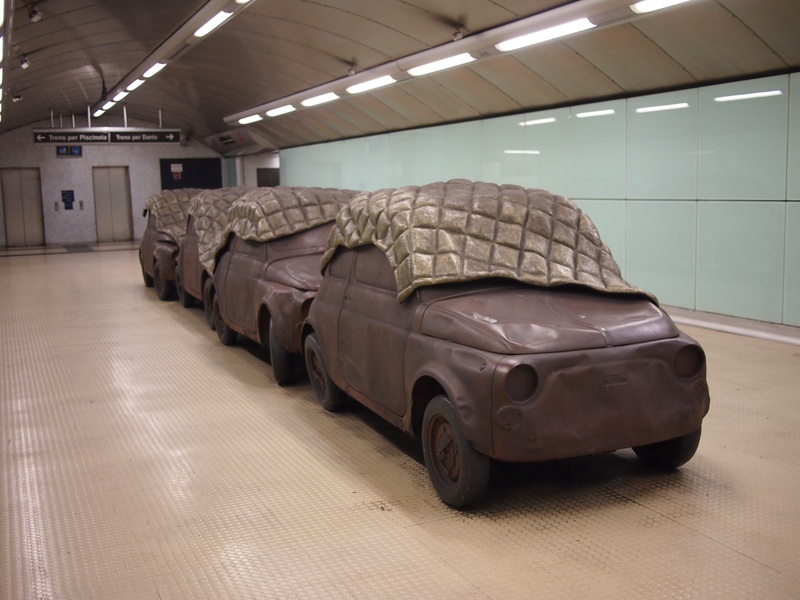 As you might expect in a city as old as Naples, some archaeological remains were found during the construction and it was good to see those incorporated into the stations’ design. Oscar Tusquets Blanca installed a skylight over the elevators in Toledo station. Connecting the platform level with the street 40m above it is filled with an LED light installation. We rode around several times trying to get a centred photo! 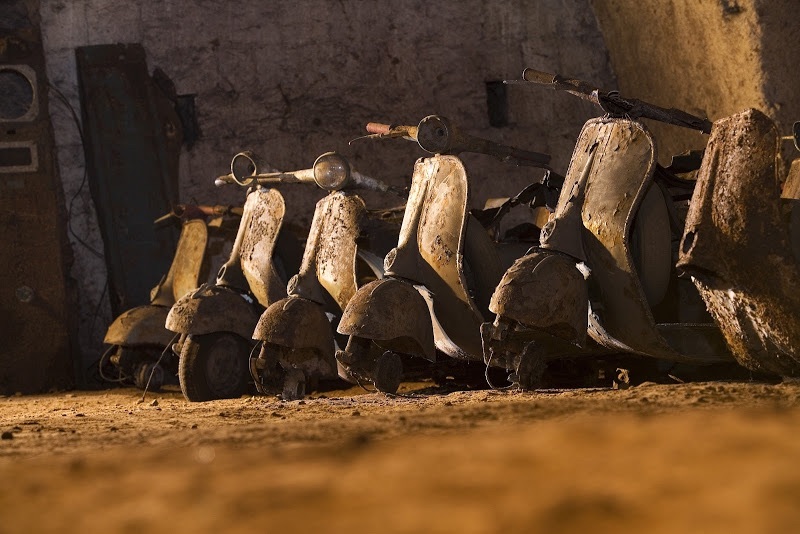 We really enjoyed the diversity of the ‘underground’ activities in Naples, all the more so because they allowed us to get out of the rain which fell on most of our days there! This entry was posted in Places and tagged Art, Italy, Metro, Naples, Underground on February 6, 2015 by Julie. What is 29 + 6 ?